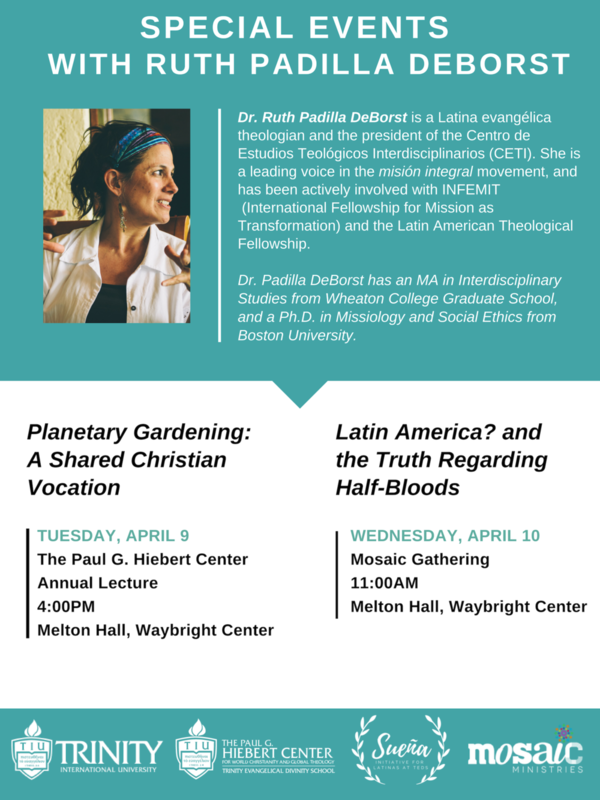 This month, we had the honor of having Mark Charles with us speaking on “Race, Trauma, and the Doctrine of Discovery” and “Whose Blood Covers Corporate, Systemic Sin?” Next month, we have the pleasure of welcoming Dr. Ruth Padilla DeBorst, arguably one of the most important voices on Latin American theology and missiology today. Dr. Padilla DeBorst has authored various articles and book chapters, including “An Integral Transformation Approach,” in The Mission of the Church: Five Views in Conversation (2016), and “Songs of Hope Out of a Crying Land: An Overview of Contemporary Latin American Theology,” in Global Theology in Evangelical Perspective: Exploring the Contextual Nature of Theology and Mission (2012). She also co-authored Mission as Transformation: Learning from Catalysts (2013), with David Cranston.